then to purchase equipment, toys, etc. 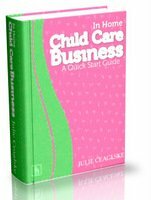 I also want to suggest you check out my new book In Home Child Care Business. A Quick Start Guide! that will give you in depth guidance on how to get started in your home and become a preferred provider and get you on your way.